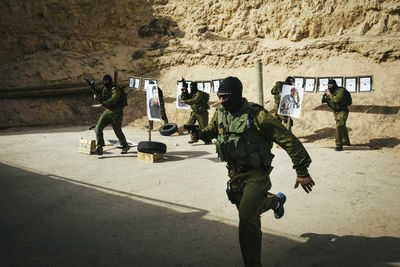 Caliber 3 - Israeli "Commando Tourism"
The Caliber 3 Academy in the West Bank area of Gush Etzyon has become a renowned training center for both professionals and amateurs alike, where people come from around the world to be trained in counter-terrorism techniques. 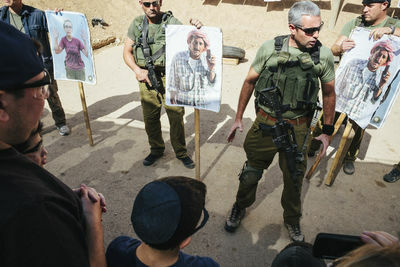 On any given training day, the trainers at Caliber 3 are instructing Israeli citizens and tourists, adults and children, in emergency response tactics and “Krav Maga,” a self-defense system developed for military in Israel and Hungary that consists of a wide combination of techniques sourced from boxing, Muay Thai, Wing Chun, Judo, jiu-jitsu, wrestling, and grappling, along with realistic fight training. American and Russian tourists are among some of the many tourists who come to the academy looking for a different type of tourism than usual. 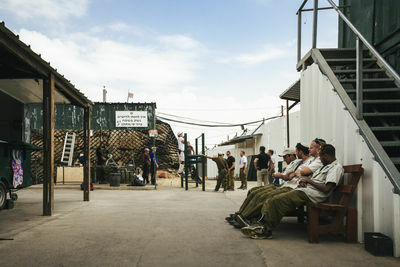 Caliber 3 advertises this new tourism as “Commando Tourism,” where people can come train alongside seasoned veterans with real-life counterterrorism experience. The bullets are true but the participants seem to be having a lot of fun. 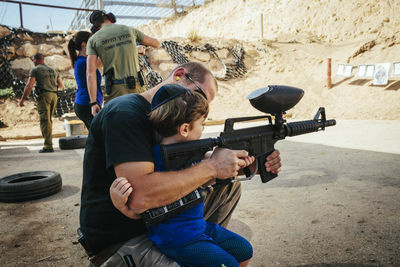 One woman, Margo, came from New York with her young son Harry to learn self-defenses, while Mary from Fishers, Indiana, came with her entire family just for a good time during their vacation in Israel. 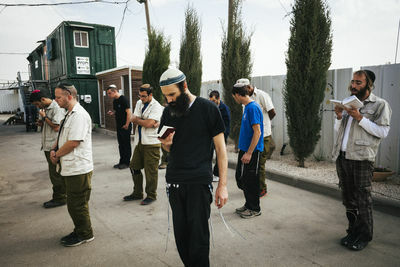 "They are mostly American and Russian Jews who have relatives or friends in the colonies," says Gat, continuing, “they want to understand what it means to live in a climate of war where you must defend 24/7 from the Palestinians." 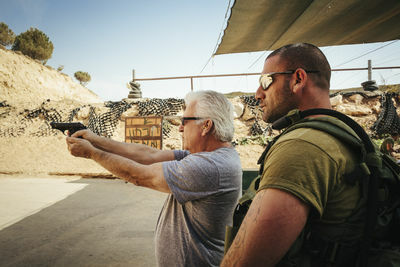 The academy includes three shooting ranges, a dining room, a Krav Maga gym and a tactical training center. Caliber 3 is dedicated to Capt. 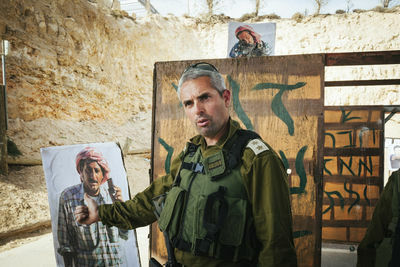 Hagai Hayim Lev, a 24-year-old Israeli soldier killed in 2002 during a military operation in southern Gaza Strip. 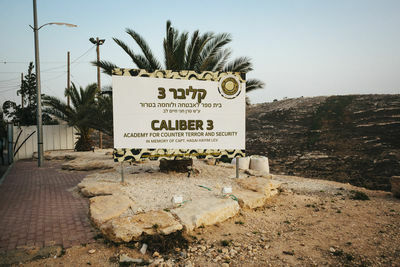 Sign at the entrance of Caliber 3 Academy in West Bank area of Gush Etzyon. It was established in 2002 by Col. Sharon Gat. 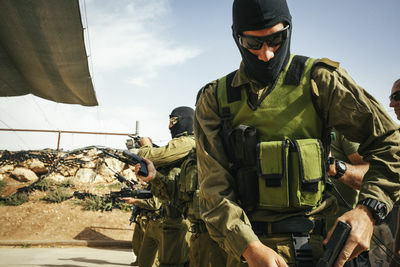 Caliber 3 works in close cooperation with the Israel Defense Forces (IDF) in the field of counter-terrorism. The place is dedicated to Capt. Hagai Hayim Lev, a 24 years old Israeli soldier killed in 2002 during a military operation in southern Gaza Strip. 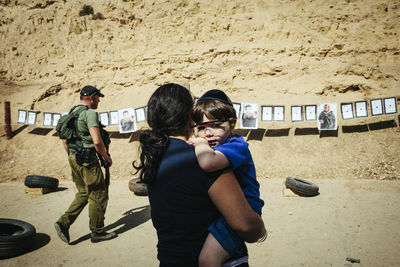 Sharon Gat, C.E.O and Founder of Caliber 3, explains to a group of tourists after a demonstration, "Even if the targets are Arabs and they don't like Jews, we don't shoot to people that are not intended to make a terrorist act." Mary from Fishers, Indiana, during a shooting session with a hand gun. She came with all her family to have a unique experience in Israel. They came just for fun and they thoroughly enjoyed it. 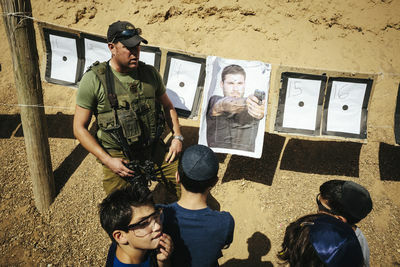 Eitan Cohen, Combat and Krav Maga instructor, during a basic shooting training session with a group of American and Russian tourists. 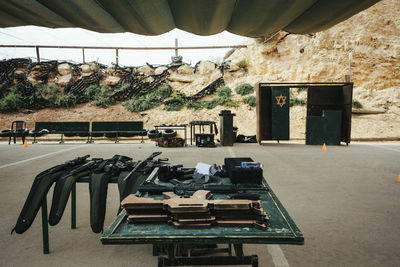 One of the three shooting rangea at Caliber 3 Academy, in the West Bank area of Gush Etzyon. 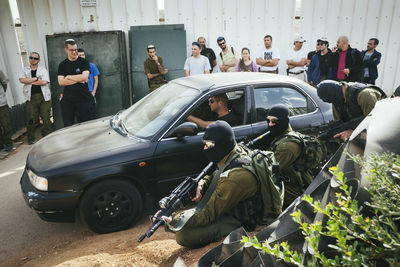 Professional team of Caliber 3 during a demonstration of a V.I.P. protection operation. 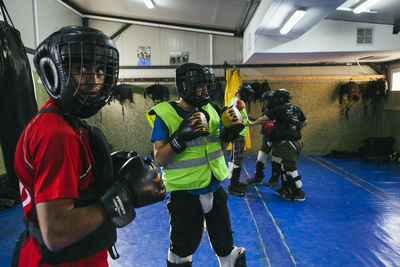 A group of Israeli young men during a Krav Maga lesson. 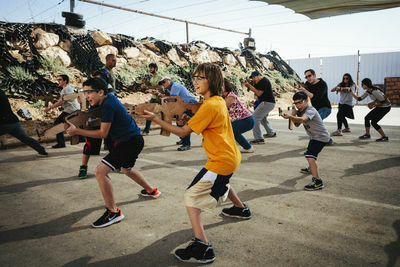 Krav Maga is a self-defense system developed for military in Israel and Hungary that consists of a wide combination of techniques sourced from boxing, Muay Thai, Wing Chun, Judo, jiu-jitsu, wrestling, and grappling, along with realistic fight training. Samuel from Fishers, Indiana, during a shooting session with a hand gun. 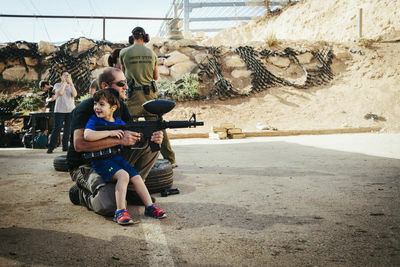 He came with his family to make a unique experience in Israel. They came just for fun. Alex Baramba, Combat and Krav Maga instructor, teaching a group of Russian tourists how to shoot with a hand gun. 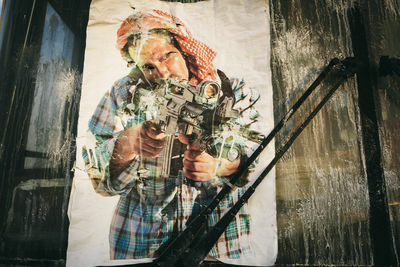 One of the several target posters used in the Caliber 3 shooting range depicting an Arab man. 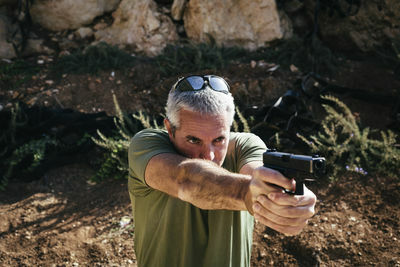 Eitan Cohen is a Combat and Krav Maga instructor who has worked at Caliber 3 for two years. In the past, he took part in several special missions in Mexico, Nigeria and India as a contractor. He's also a Muay Thai athlete. 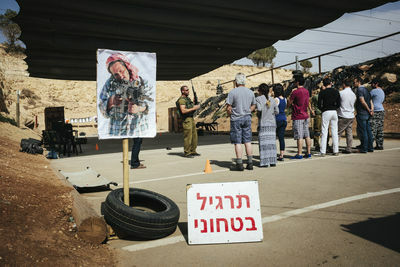 Sharon Gat, C.E.O and Founder of Caliber 3, explains to a group of tourists after a demonstration, "Even if the targets are arabs and they don't like jews, we don't shoot people that are not intended to make a terrorist act." Margo with her young son Harry, from New York, checking the results of her first handgun shooting session. Steve Gar, combat instructor, shows a group of tourist the results of a professional demonstration. All the bullets hit the center of the target perfectly. 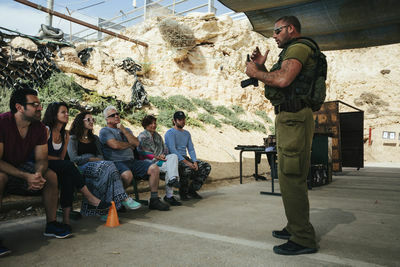 Eitan Cohen, Combat and Krav Maga instructor, teaches a group of American tourists from New York how to hold a shotgun during a "Commando Tourism" training. 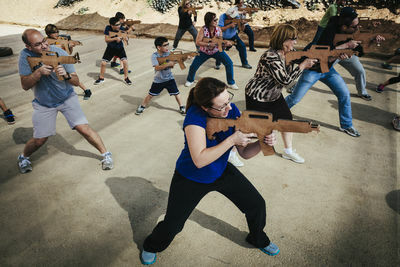 A group of American tourists from New York learn how to hold a shotgun during a "Commando Tourism" training lesson. Yonah, from New York, during his first shooting session with a handgun. Young Harry from New York enjoying shooting with a paintball shotgun. Harry from New York enjoying shooting with a paintball shotgun. Glen, 19, from the U.S. double checking the empty bullets. 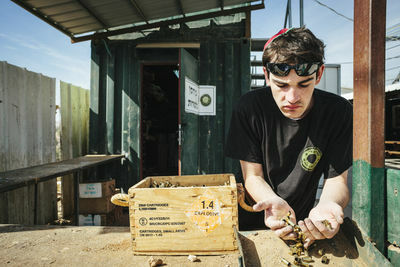 He works part-time at Caliber 3 to pay for his studies in a Yeshiva (religious) School. 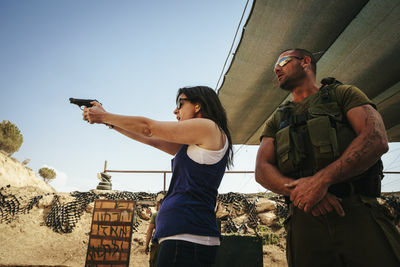 Sharon Gat, the C.E.O and founder of Caliber 3, is a Colonel in the IDF Special Forces, with vast operational experience in guerrilla warfare and counter terrorism in the field. His experience includes commanding units in special operations in Lebanon, the West Bank and the Gaza strip. During an interview he says, "We have our enemies very motivated to do attacks on us in the cities, in settlements, wherever there are Jews. We're not waiting for a suicide bomber to come, but we want to be prepared." 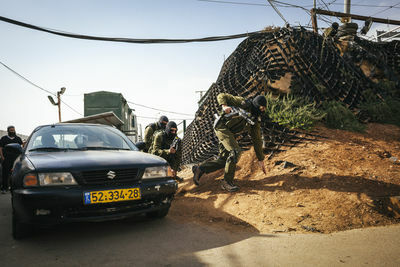 Shai Ish Shalom, Senior Combat instructor and former colonel in the Israeli Forces, trains a group of Israeli young men for becoming security guards on the light train in Jerusalem. 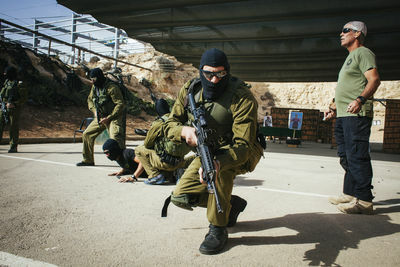 A group of Israeli young men doing excercises before starting a training lesson.